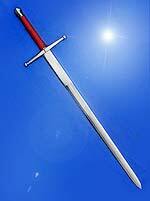 A fine medieval sword will last for generations with care or can be destroyed in one year by neglect. A sword is not just a long knife—it is forged using a variety of techniques developed over centuries to create a strong yet light blade capable of holding a good edge. The process begins when the iron metal is refined to remove the impurities by heating it to a liquid state and skimming off the slag. 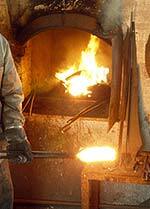 The molten metal is poured into ingot molds shaped like bricks or rods and allowed to cool. The molecular structure of the metal is is loose and unorganized at this state. It is full of tiny holes, or "occlusions" that also cause weakness in the metal. The iron is called pig iron or cast iron at this point. The blacksmith takes the black cast iron rods and beats them with a hammer on an anvil in a process called forging. While cold forging is done without heating the metal, a process best suited for gold, copper, and silver, iron must be heated to efficiently forge the occlusions out of the matrix. The more that the blacksmith heats and pounds the metal, the denser it becomes as the molecules of iron organize themselves into a tighter matrix with fewer gaps. Pattern welding (laminating various hardness steel alloys) married the flexibility of softer, low-carbon steel with the strength of harder yet more brittle high-carbon steel while preserving the best properties of each. Grinding and acid baths brought out the pattern's beauty as in this Ladder pattern by Jim Hrisoulas, author of The Complete Bladesmith. By 900AD the finest swordsmiths were forging thin plys of high- and low-carbon steel into sword blanks, sometimes even adding blade edges and points of a different steel composition. Modern steel can be ordered in many different alloys making it possible to create blades as good or even better than those used historically without having to pattern weld or laminate the steel. Swordsmiths today can buy steel pre-forged to the proper gauge for cutting blanks to make swords, leaving only a little forging to be done by hand. Sword blanks are roughly the shape of the finished sword and include the tang (handle core). The smith pounds the blade edge to rough out the slope; however, too much pounding on one side will cause a curve in the blade (this is how scimitars get their shape). Removing part of the metal by filing or grinding creates the final edge. The metal of a good blade has to be free of flaws and impurities that can cause it to break. It needs to be tempered (heat treated) carefully so that all of the molecules organize into a strong crystalline network from the end of the tang all the way to the sword point. When this is accomplished, the blade rings like a tuning fork when struck. The purer the sound, the purer the metal and the lower its chances are of cracking or breaking under stress. The shape of the blade has been refined over the centuries through the interaction of blacksmiths and their customers. The length of a typical one-hand sword was limited to the distance between the grip and the ground so that the fighter could swing the sword without dragging it in the dirt. However, a sword made to be used from horseback needed to be longer and heavier. Since the foe was usually unmounted, the knight used a downward, hacking motion making a tip-heavy sword ideal, but a different balance point was needed for fighting on foot. Constant feedback and experimentation led to rapid improvements and a wide variety of designs for differing purposes. To make the blades lighter while maintaining their strength, improvements like "fullers," mistakenly called "blood grooves," were developed. 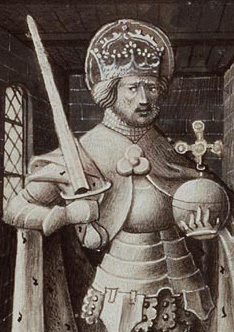 The earliest swords didn't have cross guards on the handles. They were added to protect the hand, improve the balance, and provide more control of the blade. Since the hilt is the only part of the sword seen when it is in a scabbard, the most prestigious blades had hilts that were decorated with mounts, carvings, inscriptions, and occasionally jewels. The parts of the handle or hilt are the guards (called quillions when exta long, the grip, and the pommel. The pommel gets its name from the French word pomme or apple. Occasionally, reinforcement rings called ferrules were placed between the pieces. All of the pieces together were referred to as the "furniture." Each piece of furniture had a hole in the middle so that they could be slipped onto the tang. The pommel acted as a nut on the end to hold the pieces together tightly. If it had a hole halfway through, it was threaded so it could be screwed onto the tang. Expensive handles were threaded so that the blades could be replaced when damaged, however, they could loosen with wear. The pommel on less elaborate swords had a hole all the way through so the tang could be hammered or "pinged" tight. The pommel also serves as a counterweight and is very important for proper balance. The difference of a even a few grams in the pommel can move the balance point of the sword. Some blades are sharpened all the way to the hilt, others have a flat, unsharpened section near the guard called the table or riccaso. The table can be very wide on two-handed swords and offers a safe place to "grip up" on the sword. 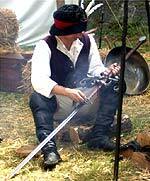 Scottish blades have sloping quillions with a tongue of metal reaching onto the blade that is called the langet. The grip was usually made of carved wood, sometimes covered with leather, but since it could get slippery with sweat and blood, some grips were wrapped in twisted wire. Grips wore out and were replaced on a regular basis so, historically, they were rather plain. Now, swordsmiths put more effort into making beautiful grips from rare hardwoods with inlaid metal and carving. The worst thing you can do to a sword is store it in the scabbard. Since humidity can't escape, moisture is able to attack the blade and cause pitting, stains, and rust. Swords and knives should be displayed bare on sword racks so that air can freely circulate around them. It also allows you to observe whether any adverse changes are occuring. A blade forgotten in a scabbard can be destroyed by rust before you take it out again. Scabbards should only be used when you are carrying the sword on your person. Take a soft cloth and wipe down the blade whenever it is touched to remove skin oils that could etch fingerprints into the surface permanently. More thorough cleaning should be done once a week in humid climates (or if you're using evaporative cooling), or once a month in dry climates. This will also remove dust that can cause pitting if left on a blade and it gives you a chance to see if any environmental factors are affecting the finish. Drape a piece of leather or fur over your lap or work table and clean off the old oil from the last cleaning with a soft cloth and mineral spirits or WD-40®. Polish the blade with Simichrome® or other metal polish and protect with a light coat of mineral oil. For longer storage between cleanings protect the finish with a paste wax like Renaissance Wax®, Turtle Wax®, or a neutral shoe polish. For extended storage or shipping, you can coat the blade in Cosmoline® or Vaseline® and wrap in plastic. For short trips or shipping by air keep your blades in a gun case with silicon gel packs to absorb moisture. If you need to clean old Cosmoline off a sword, automotive brake cleaner works great. Sudden changes in temperature can accelerate rusting, so never store your blades in a car and always examine and clean your blades when they are exposed to shifts in the weather. Rust must be scrubbed off with Simichrome or other metal cleaner then neutralized with a weak acid (like vinegar or lemon juice). Rinse with water, dry, polish, and then a apply a light coat of mineral oil. Stains from dyes or markers can be cleaned with salt-free butter. Some manufacturers print their logo or the country of origin on the blades with ink that can be erased with a pencil eraser. Light pitting can be rubbed out with fine sandpaper and emery cloths working with the grain of the metal, but this can take a lot of time and effort. You can also buff your blades using a polishing wheel and black jeweler's rouge. If you want a bright shine, finish buffing with red jeweler's rogue. More blades are damaged by abuse than neglect. Hacking into trees can ruin the edge and cause deep scratches. If it sticks in the wood you can further damage or even break the blade by twisting it as you try to free it. But if you take good care of your blades, handle them carefully, honor their history, and prize the skill that went into their making, they will be as beautiful and effective 50 years from now as they are today! If you want to add this article to your list of favorites or email it to a friend, please use this permanent URL, https://stores.renstore.com/-strse-template/0610A/Page.bok. Permission is granted by the author to quote from this page or use it in handouts as long as you include a link back to Renstore.com.